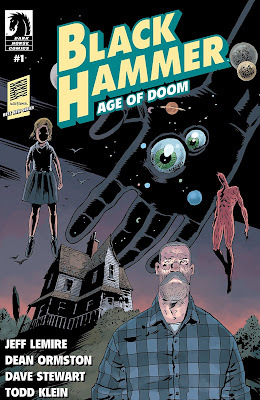 I'm sure there was another time that I looked forward to a book as much as Black Hammer: Age of Doom #1 but I can't remember when. The previous run of this series (plain old Black Hammer) was in my view more or less everything I want from a comic book series. A whole integrated universe, interesting characters, stylish art, mystery and a little tint of nostalgia for the golden age of comic books. The creative team behind this book really did achieve something worthwhile in the first run of books. Since then we have been left on a cliffhanger of some importance, and while the Doctor Star and Sherlock Frankenstein books have helped weave more complexity into the Black Hammer-verse, this issue is what we have been waiting for ever since Black Hammer #13. The issue picks up immediately where we left off. Lucy Weber has now become the new Black Hammer following in her father's footsteps. At the end of the last issue we thought she was going to reveal the answer to the mystery of Black Hammer farm. This issue, right as she's about to reveal to our favorite heroes how they got stuck on the farm and can escape....she vanishes! The story then splits into two parts. Lucy, as our new Black Hammer finds herself trapped in a gritty world filled with (as per the description of this book) "punk rock detectives, emo gods, anthropomorphic humans, absurdist heroes, and many more weirdoes". I have to say that the bar looked to be filled with some mighty fine company and I could have happily chilled out there, Lucy, however, has different ideas. Meanwhile, back home on the range Abe, Gail, Colonel Weird, Madam Dragonfly and Barbalien are now not only bamboozled by their inability to escape (although there are always hints some know more than others about that), they now have a separate mystery to solve, i.e. the whereabouts of Lucy. Will the books in the library filled with blank pages provide a clue? Well, this series picks up where the last one left off without so much as missing a beat. For those of you worrying about whether the number change back to issue 1 would leave a gap in the story fret not. 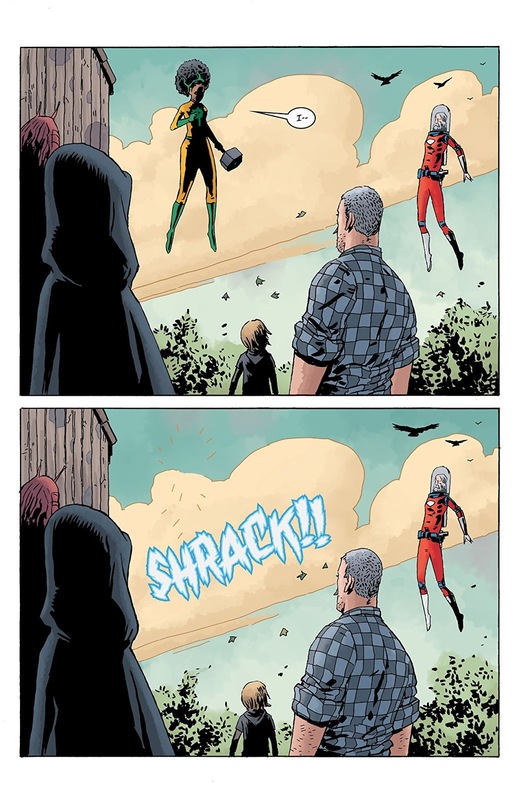 This issue might as well have been Black Hammer 14. The art is as superbly vintage in tone, yet fresh as always in its execution, and the storytelling is as stellar as ever. Leaving us with another mystery...where does Jeff Lemire find all the time to do so much awesome work?